UNITED NATIONS, September 11 -- On Tuesday at the UN, the official with the longest title spoke, slowly at that, about his mandate. Cheick Sidi Diarra, Under-Secretary-General and High Representative for the Least Developed Countries, Landlocked Developing Countries and Small Island Developing States, summarized a meeting he recently attended in Mongolia. Inner City Press asked why his title is not longer still, since it has been said that the LDCLLDCSIDS mandate now also includes the Office of the Special Advisor on Africa, which Ban Ki-moon is consolidating. Mr. Diarra answered that the OSAA still exists, but now reports through his office. Will the full consolidation require General Assembly approval? 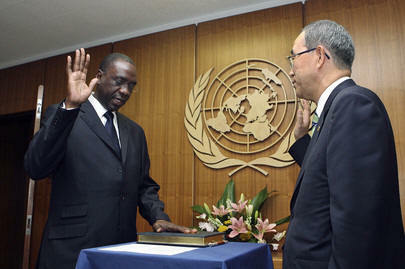 Mr. Diarra indicated that it would -- and he has served in the General Assembly, for Mali. Sources say negotiations on the closure are moving toward, well, closure. Inner City Press: There's this report that Mr. Suleiman Jamous still somehow didn�t move to get medical treatment. Can we find out whether he has actually gone and got the treatment? Spokesperson: I can check that for you. Inner City Press: And also there was Ms. Coomaraswamy, I think she was going to be the guest at noon yesterday. Spokesperson: Yes, she could not come, but we will try to reschedule her. The problem is that we have press briefings every day now until the 14 and beyond, so we'll try to see whether we can have a better time for her so that she could come as closely as possible to her trip. Another press conference was unceremoniously cancelled on Tuesday. Humanitarian Coordinator John Holmes, first slated to address the media about Congo at the Security Council but bounced by UNDP's Kemal Dervis, appeared at 2:30 p.m. in the briefing room. But there were so few reporters that he quickly left, the UN TV screen fading to black. He will, it is said, be available at 11 a.m. on Wednesday. We'll be there. Inner City Press: Uganda has apparently complained about reporting by the UN-run Radio Okapi of Uganda mass[ing] troops on the border of the Democratic Republic of the Congo. Does the UN have any response? Does it stand behind its report of Ugandan troop movements there? Spokesperson: You're talking about the press report by Radio Okapi? Spokesperson: We are not going to comment on that at this point.